A MiniDisc (MD) is a small magneto-optical disk. It is used as a replacement for the Audio cassette. It was developed by Sony to store music. Later it was modified, so it can also store data. The music it stores is compressed in some way, like an MP3. Recent Hi-MD models have the option to not compress audio, and offer audio identical to CD-quality. 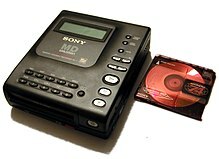 MiniDisc recorders allow the user to modify the contents of (recordable) disks. That way, tracks can be split, combined or rearranged. Audio tracks can be input while a live recording is in progress, too, for example, while recording a live concert or interview via the microphone input on a MiniDisc recorder. This page was last changed on 22 June 2018, at 09:33.